Les Eyzies has only a few hotels, but there are guest houses as well, and more hotels in nearby villages and towns. There are not a lot of hotels in Les Eyzies because the village is so small, hemmed in by its giant limestone cliff on one side and the River Vézère on the other. Still, there's a good range, from the very comfortable 3-star, 24-room Les Glycines at the northwestern end of the village between the Gare and the bridge over the river, which has its own outdoor swimming pool; the 3-star, 20-room Hôtel Le Centenaire at the southeastern end of the village; the 2-star, 16-room Hôtel de France and Auberge du Musée just a few steps from the Musée national de Préhistoire; and a number of chambres d'hôte (guest houses) scattered throughout the town. 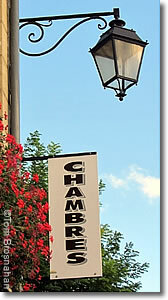 Other lodging possibilities are in the nearby towns of Montignac next to Lascaux, and in Sarlat-la-Canéda, which has a large number of good hotels in all ranges of price and comfort. 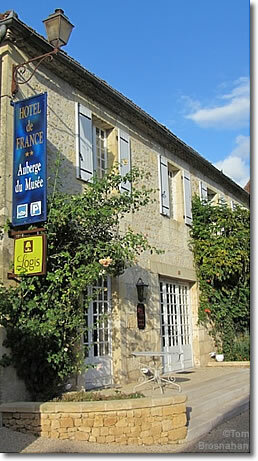 Hôtel de France, Les Eyzies, Dordogne.